The Manila satsang group visited the Estero de Paco Manila & Segregation Bin Making, Activity Center, Paco Market. The banks of the newly rehabilitated estero of Pasig is home to hundreds of families living in slums around downtown Manila, next to the Paco Market. 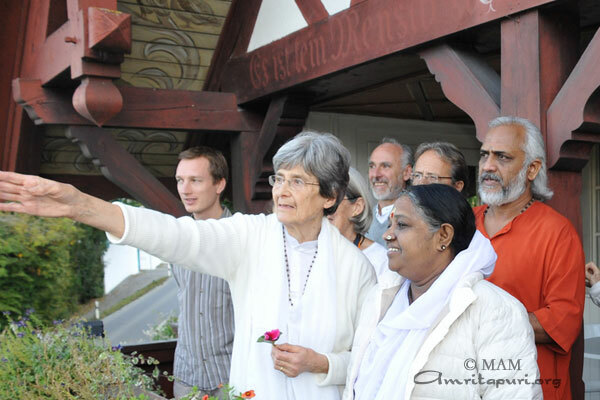 The satsang group was guided by the community leaders in building structures to hold the recycling bins. They proudly finished the new recycling bins to be distributed amongst the city residents to help keep their surroundings clean and green. ‘You may recollect what this river used to be like,’ said Mayor Lim, standing next to a bleak reminder of what the estero looked like, engulfed with garbage before the clean up. The cleanup drive was spearheaded by ABS CBN Foundation’s Pasig River Cleanup Project. 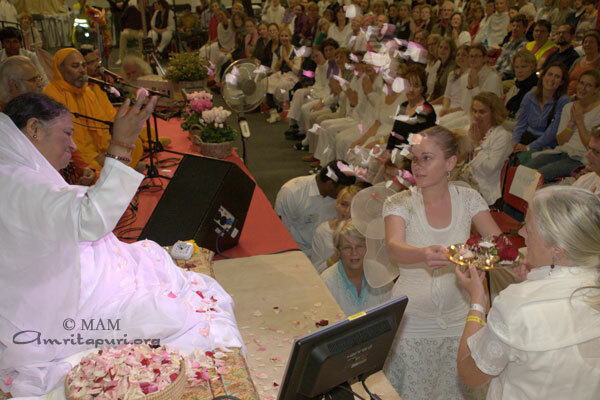 Amma returned to central Europe after her short trip to the Scandinavian country of Finland for the next stop Amsterdam, Holland. 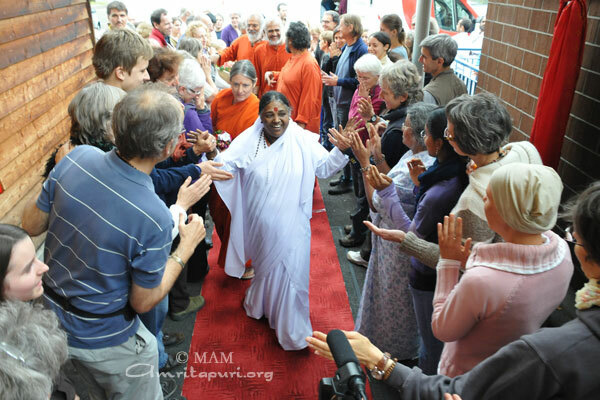 A large crowd gathered to welcome Amma to the city, as she greeted everyone with high fives. 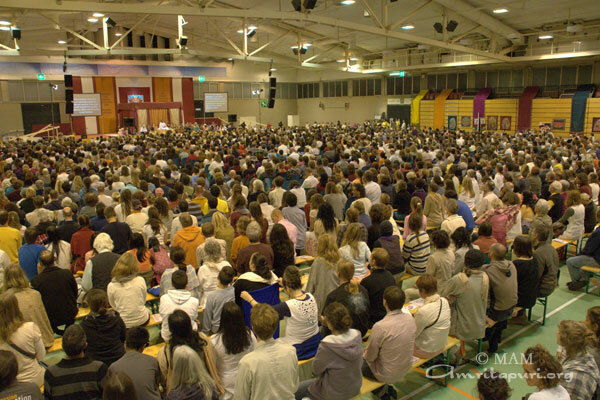 The three day program included Bhajans Meditation, Satsang and an Atma puja which saw countless curious youngsters crowd the stage to watch Amma perform the ceremony. 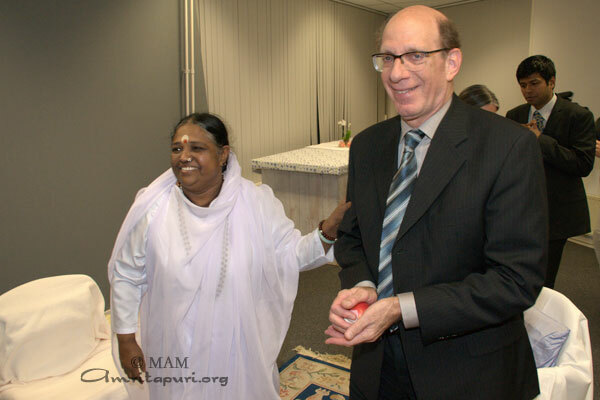 Renowned computer scientist, Andrew Tannenbaum, the father of operating systems, came to meet Amma, and shared how he was amazed at Amma’s ability to be able to take care of so many projects and at the same time spend, despite the fact that she spends all day meeting people for darshan. 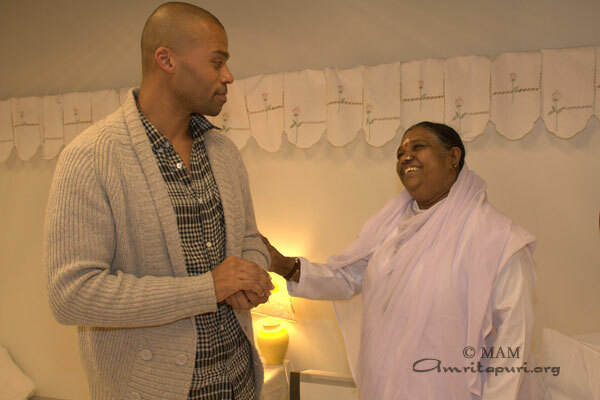 World champion kick boxer Lucia Rijker, better known for her role as the fierce boxing opponent of Hillary Swank in the Hollywood blockbuster ‘Million Dollar Baby’ also came to receive Amma’s blessings. 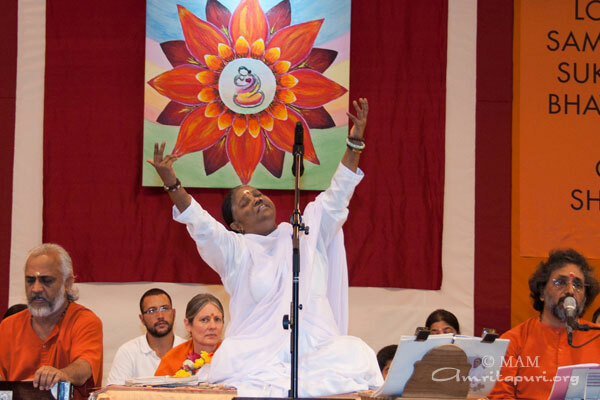 Shantamrita lead the lively bhajans and Atmapuja. 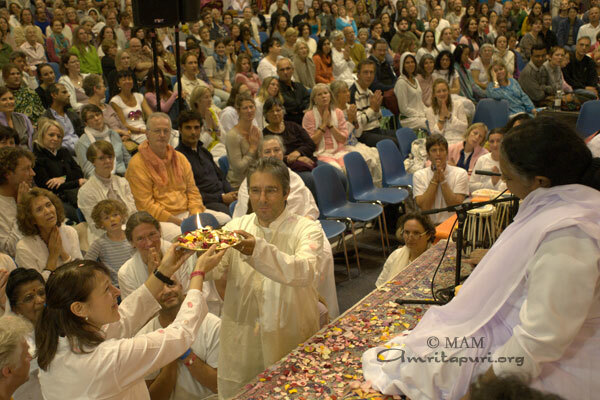 People offered flower petals to each one’s deity in the puja. 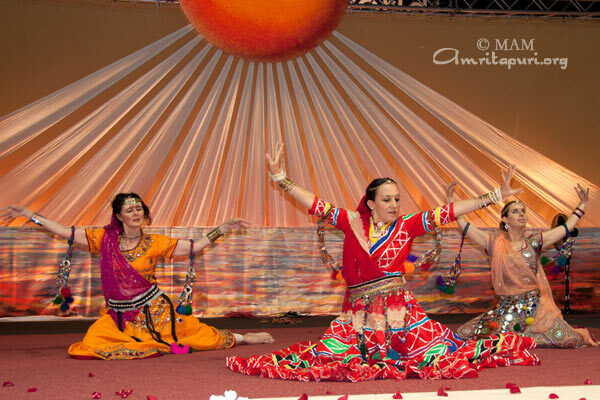 They enjoyed an intimate moment bathing in the light during the arati. 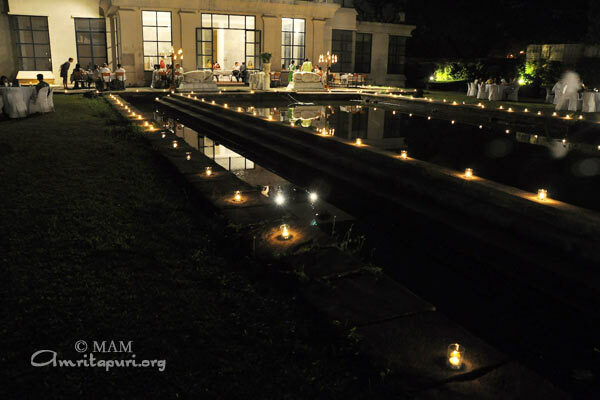 Sacred lights of Diwali were arranged beautifully for the evening satsang after the Puja. 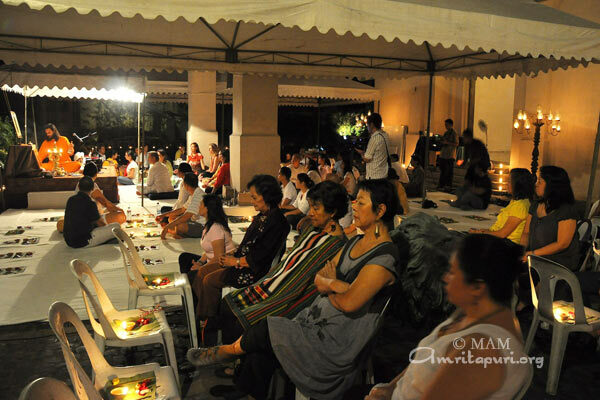 Amma Center Manila gets down to work. 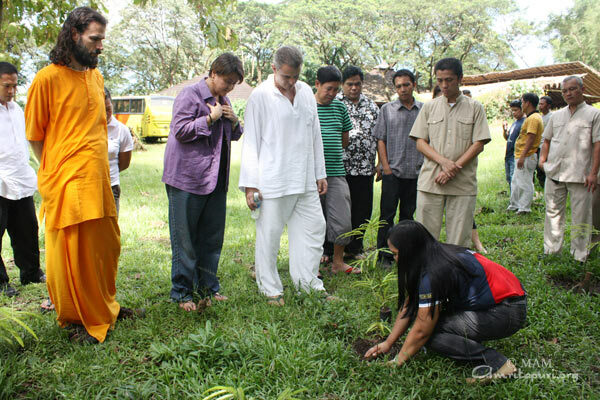 Participants begin by reconnecting with the earth as they pot some soil in preparation for planting tree saplings. A ranger from La Mesa Eco Park demonstrated planting in preparation for the ceremonial tree planting that was done by Br. 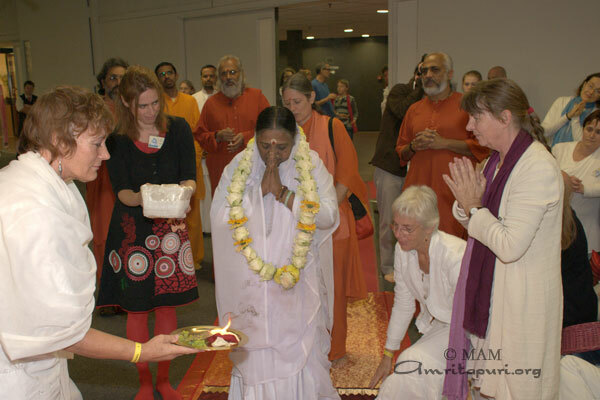 Shantamrita with Amma Center Manila members: Senator Jamby Madrigal-Valade and her husband Eric Valade. 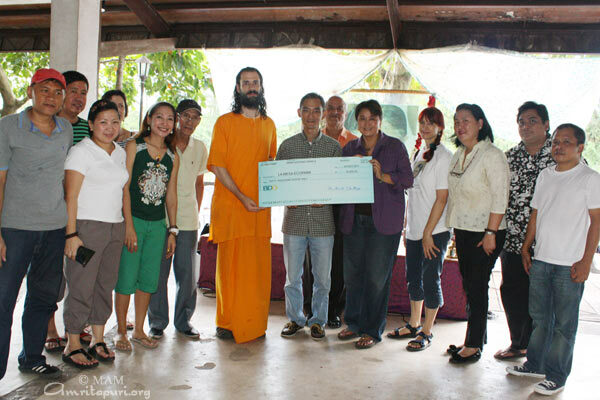 Amma Center Manila donates a 50,000 Philippine Peso check to La Mesa Eco Park. 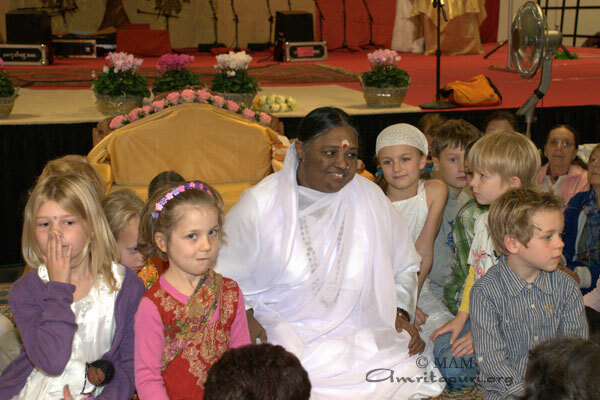 After the Swiss Program, Amma flew directly to the capital city of Finland, Helsinki to conduct 2 days of programs there. 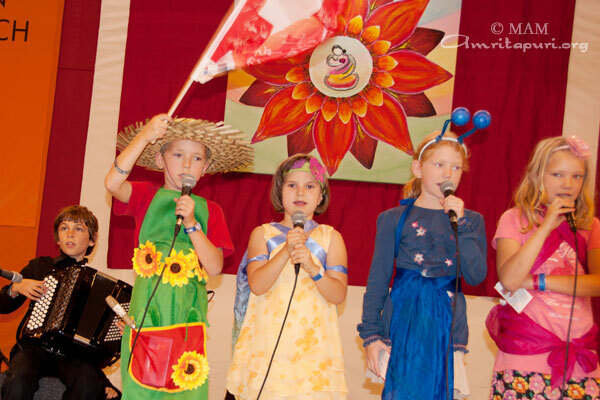 She was received by the famous actor and member of Finnish Parliament, Mr Jani Toivola. 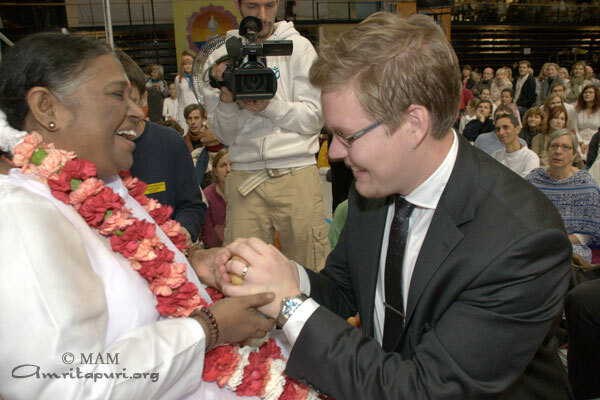 Later during darshan, The Chairman of Vantaa City Government and the member of Finnish Parliament Mr Tapani Makinen also was on hand to welcome Amma. the Chairman of Vantaa City Council and the member of Finnish Parliament Mr Antti Lindtman was also present to receive her Darshan. 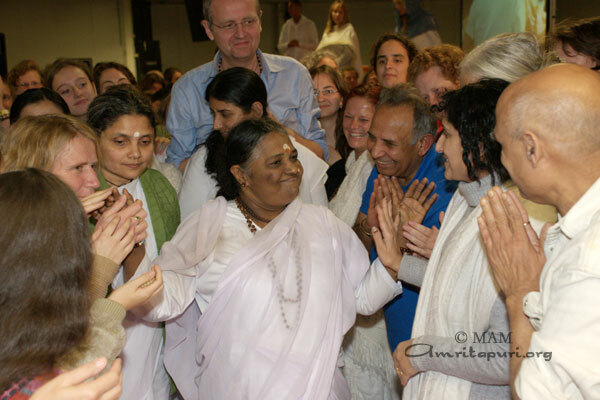 A host of celebrities turned up to receive Amma’s blessings, including the well known Finnish Rapper, Paleface who performed for Amma as she was giving darshan. 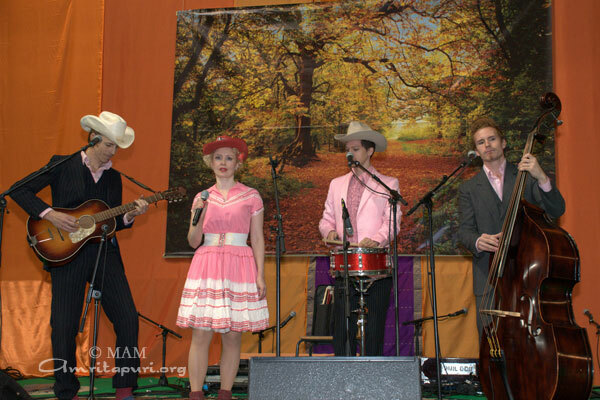 Also, a well-known Scandinavian band came to pay tribute and show their love and respect. 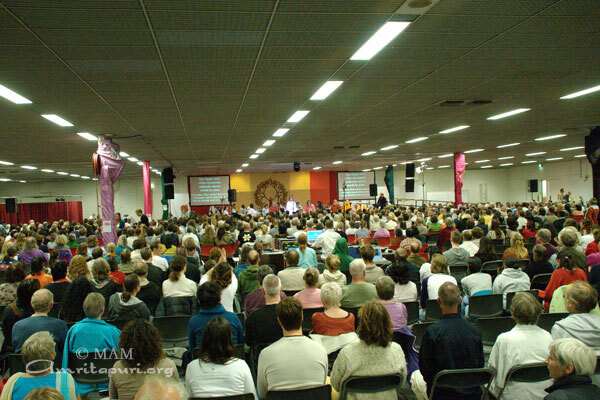 The first IAM course in St. Petersburg took place on 1 and 2 October. 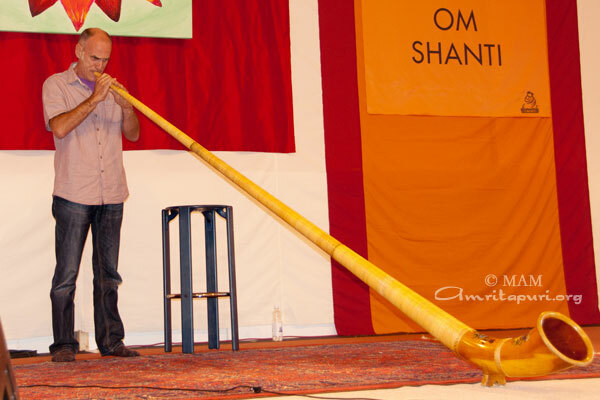 It was taught over two full days in a seminar center near downtown St. Petersburg. 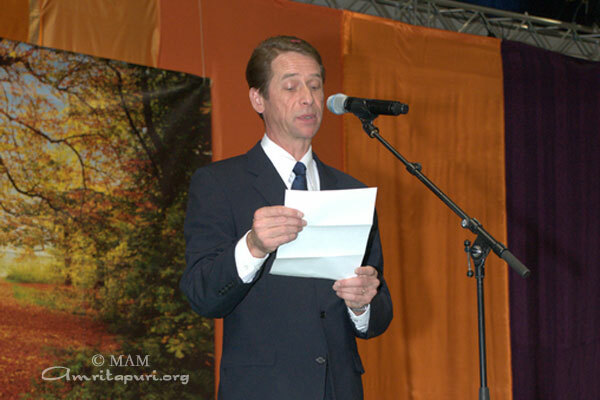 The instructions where translated by a local who has learned the IAM technique in India. 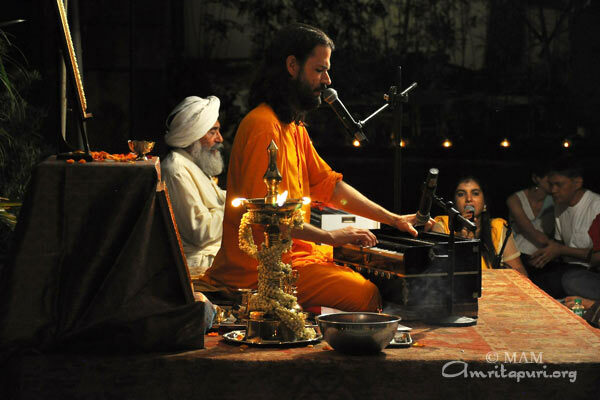 There were bhajan sessions, too, in the evenings. 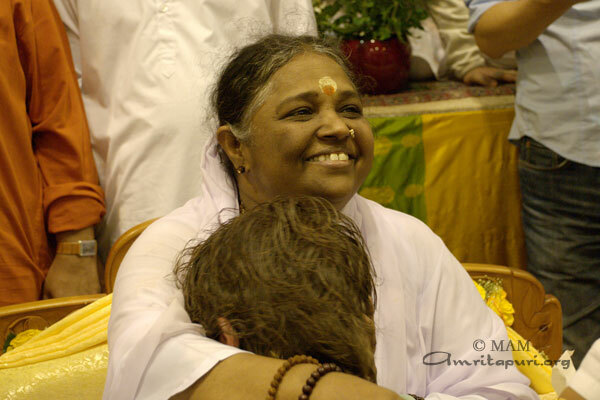 Everyone deeply appreciated this gift from Amma. 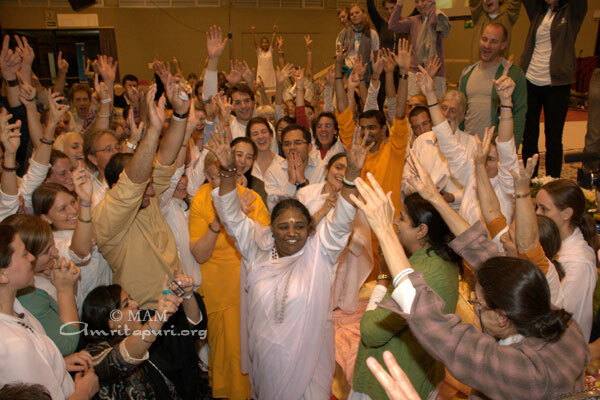 There was a joyous sendoff for Amma as she left the Italian Milano program with throngs of cheerful and jubilant people. The hills and valleys of Switzerland provided a scenic and powerful backdrop as the tour headed for Zurich. 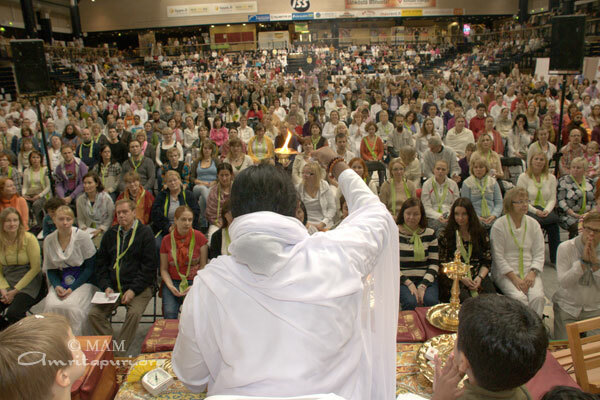 Traditional horn melodies set the mood as the crowds greeted Amma on the second leg of the European tour. 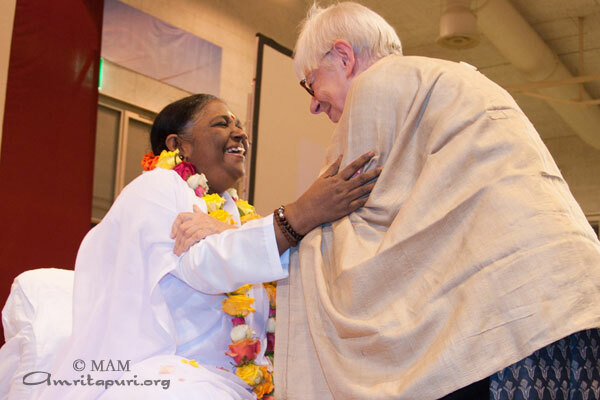 Dr. Cornelia Vogelsanger, who welcomed Amma to Switzerland for the first time back in 1987, once again garlanded her with sincere love and appreciation. 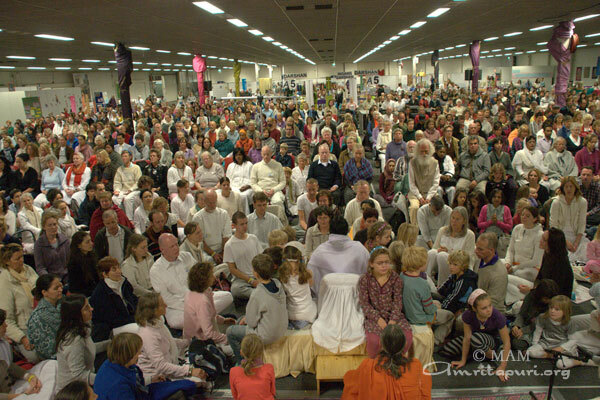 Members from the Asian Art and Rietberg Museums were also on hand to welcome Amma. 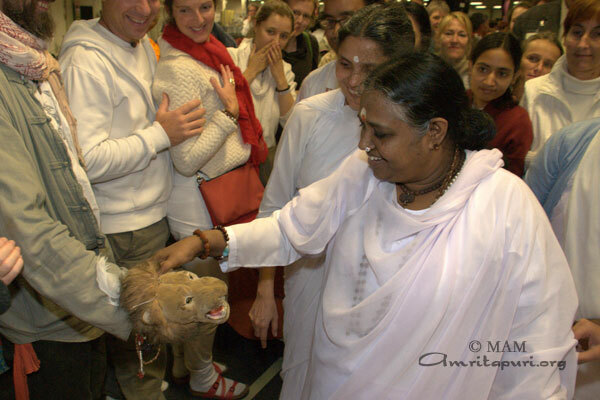 The day marked 25 consecutive years that Amma has visited the Switzerland for the European tour. 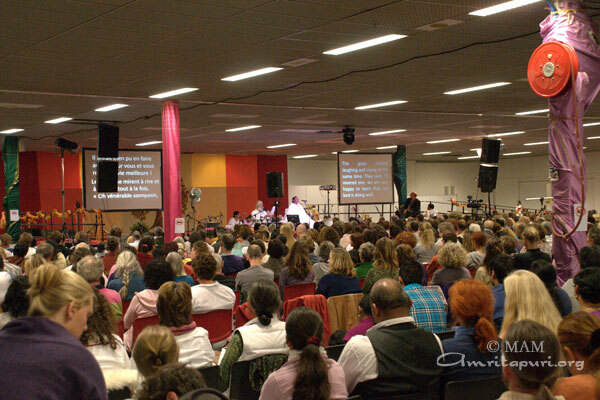 There was Meditation, Bhajans, Darshan and Satsang at the 3-day program while Amma conducted the Atma Puja in which thousands participated. 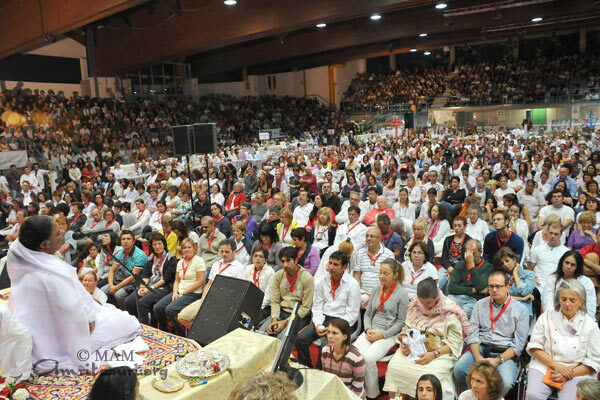 Amma began Her 2011 European Yatra in Milano, Italy. 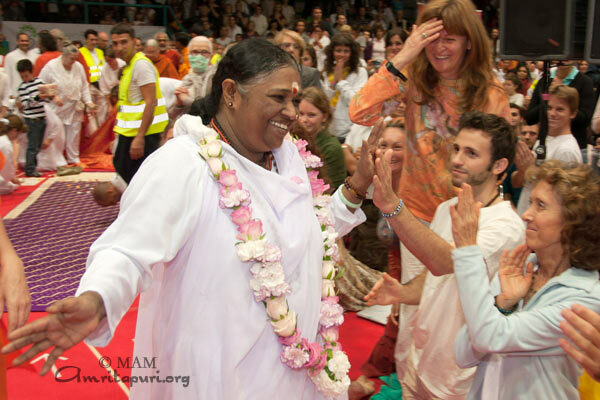 She was traditionally welcomed in Italian fasion, by heart warming cheers and applause from a huge crowd, on each day of the program, who had queued for hours to receive Her blessings. Mr S.K Verma of the Consulate General of India and Mr Claudio Zucchi an authority from the Milano Sesto District Mayors office were present to officially mark Amma’s 25th consecutive visit to Italy. 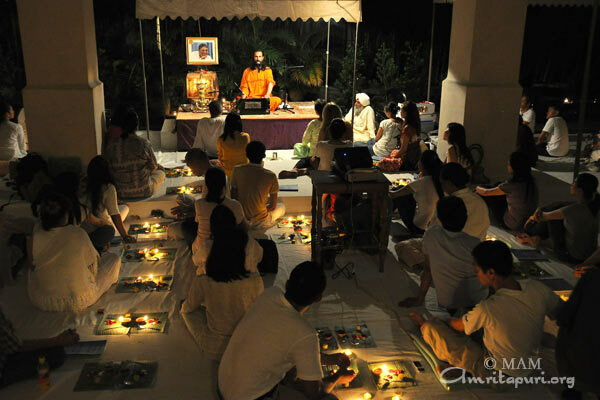 Along with three days of programs of Meditation, Bhajans, Darshan and Satsang, Amma also conducted the Atma Puja in which thousands participated. 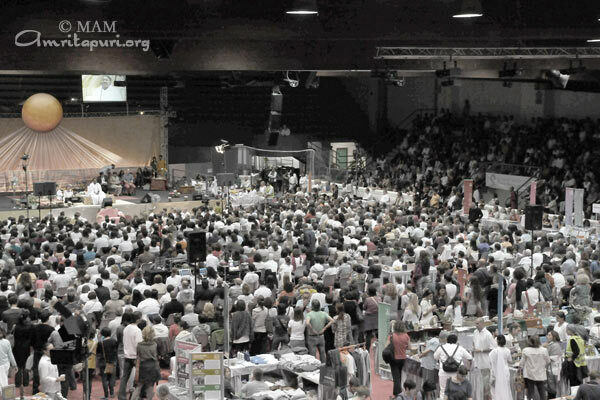 Two of the most popular television channels from Italy RAI 2 AND RAI 3 showed up to film a short documentary film on Amma, highlighting the topic of Womanhood and women’s role in today’s society. 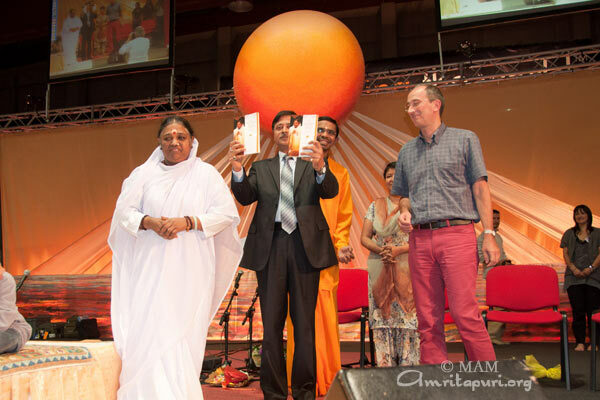 Their aim was to demonstrate that Amma is the right kind of role model for the women of the world today. 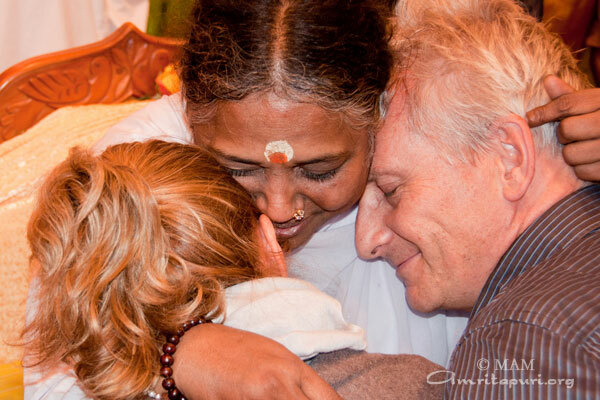 A well known Priest of the Saint Francis Order, Father Antonio returned for darshan 3 days in a row after being completely overwhelmed by Amma’s love and compassion saying that she is like a doorway to heaven. 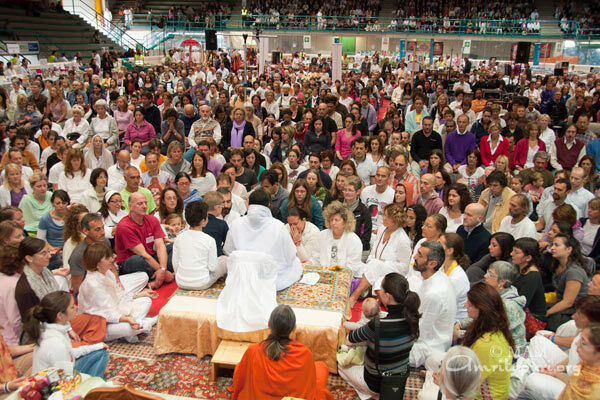 During the past 2 weeks Swami Ramakrishnananda Puri travelled across South America visiting Peru, Brazil and Chile. 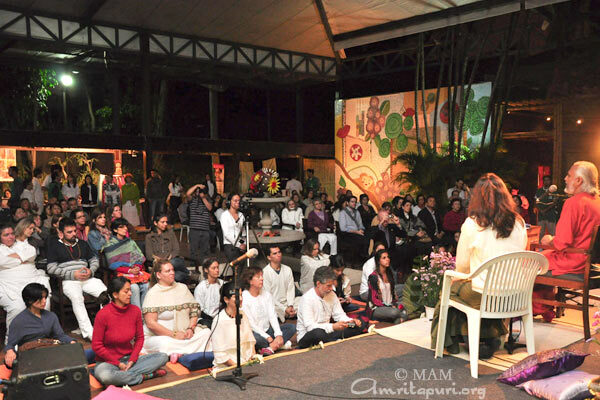 Swami conducted 3 days of programs throughout the capital city of Peru. 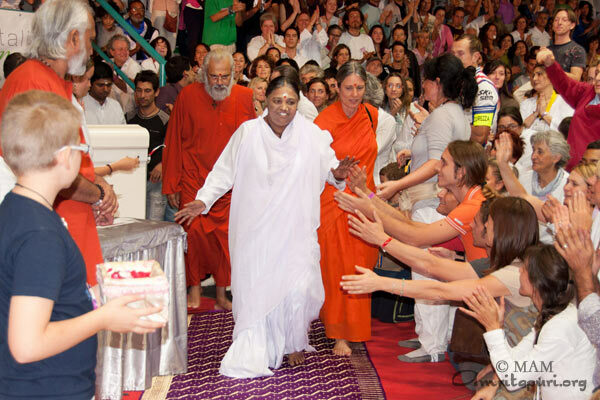 While in Lima Swami met with several government officials, including: Hilaria Supa, the Peruvian representative of the Andean Parliament, the Vice Minister of Intercultural Affairs, Mr Clemente Otta and Manpreet Vohra the Ambassador of India to Peru, who all expressed a keen interest in bringing Amma back to South America. Additionally there an IAM class was held. 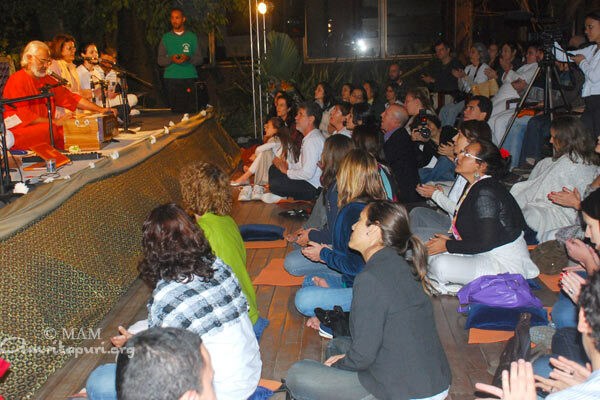 Two days of programs were held at the beautiful Espaço Singular hall. 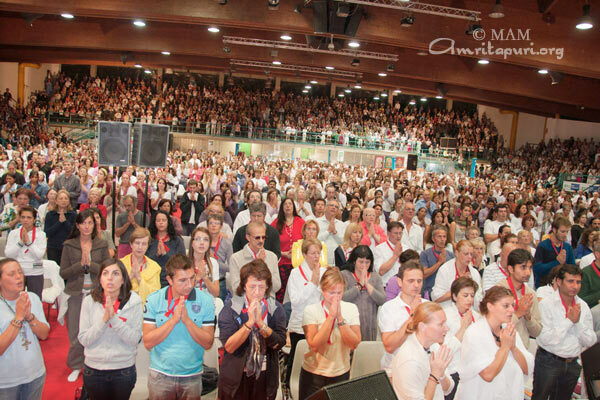 From there Swami travelled up the coast to Rio de Janeiro at had a program at the Forte do Leme military base at the end of Copacabana beach. 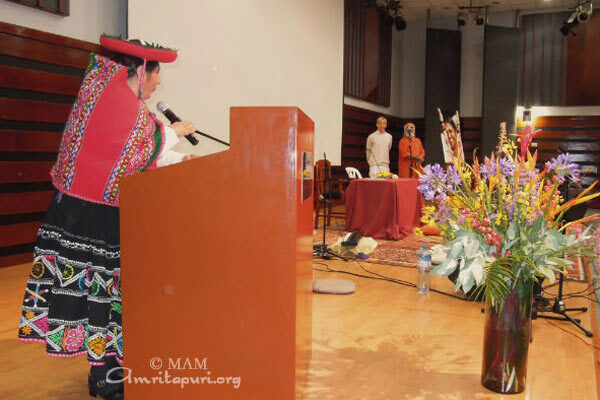 At Templo Amrita in the town of Araruama and conducted a ceremony for world peace and prosperity. 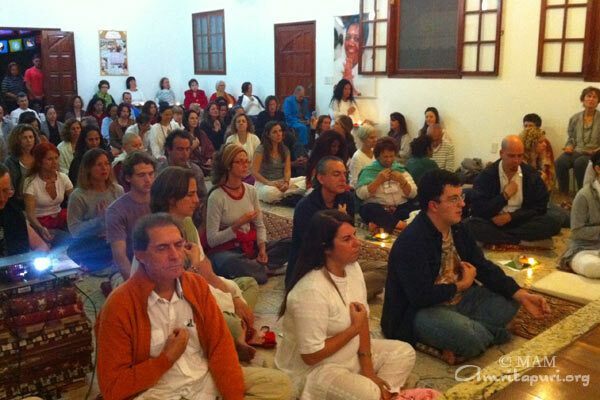 The next day on September 27th, Swami returned to Rio to celebrate Amma’s birthday with a lively bhajans session with all the Brazilian devotees. 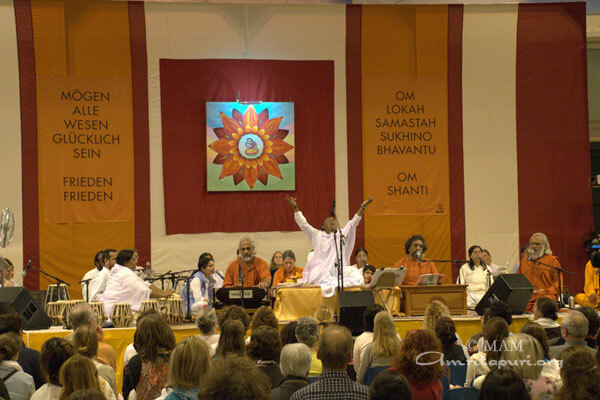 From the Atlantic coast of the continent Swami then held his next program in Viña del Mar, Chile overlooking the Pacific Ocean on the campus of the Universidad del Mar. 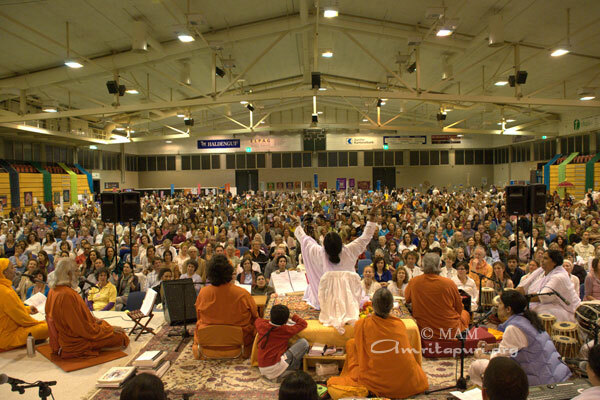 The program hall was packed to capacity by an enthusiastic crowd. 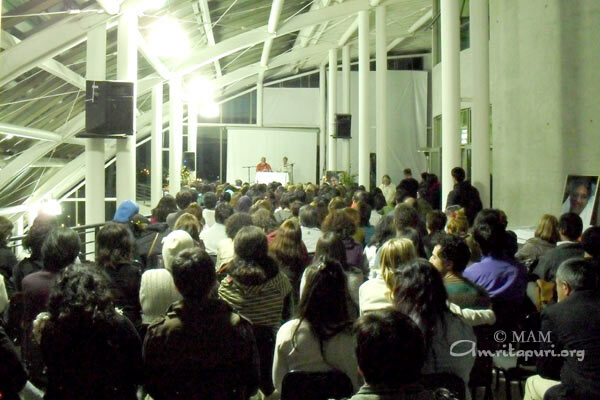 Swami’s final program of the tour was held at the foot of the majestic Andes mountains in Santiago, Chile. 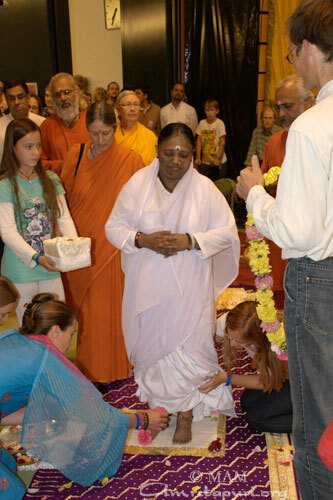 There was no need for Swami to remind the crowd that this was the place, in 2007, where Amma first set foot on South American soil, as many in attendance had been there to have Amma’s darshan five years earlier. 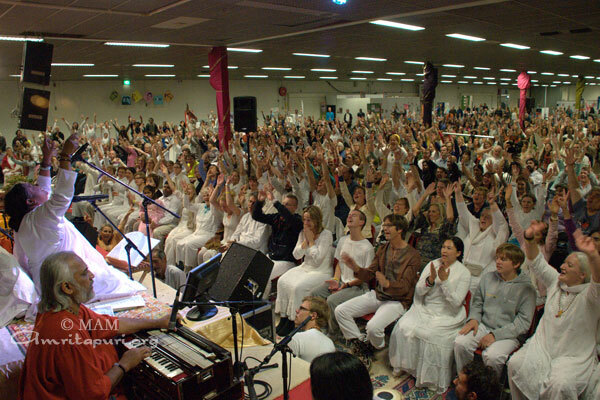 Swami ended his last satsang by voicing the desire of all those who had attended his programs during the trip and praying that Amma may soon return to shower her blessings on South America. 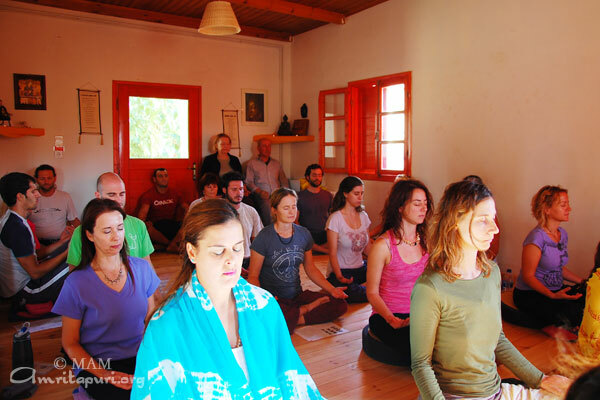 IAM course was held in a retreat center at Sunshine House in Halkida, one hour distance from Athens.